Since 2014, CARTHA has provided a platform for critical thinking on architecture and society. Founded by an international team of architects and designers, it aims to bridge the gap between theoretical and practical approaches to contemporary architecture. Each year, CARTHA initiates research and the publication of four issues on a topic in its online magazine that are then brought together in an annual book. 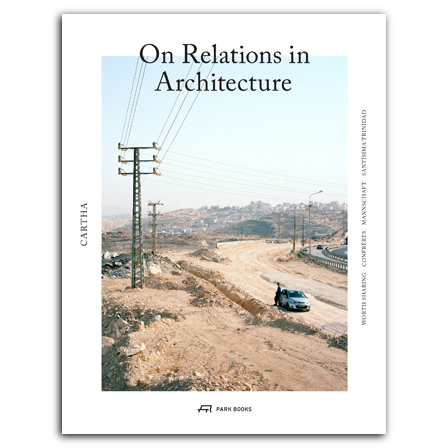 In 2015, CARTHA’s topic was relations within the architectural spectrum. Contributions explore models of collaboration and the ways in which architects relate to other architects, clients, workers, and users of space. Each of the four issues—Worth Sharing, Confrères, Mannschaft, and Santisima Trinidad—features an introductory interview with a renowned architect or firm, including Diogo Seixas Lopes, Grafton Architects, Samuel Schulze, and Marco Serra. Photography in the 2015 edition of CARTHA includes series by Guido Guidi, Rasmus Norlander, Joël Tettamanti, and Onnis Luque. With a foreword by Rebekka Kiesewetter and contributions by Walter Achermann, Abdul Fatah Adam, Atelier Angular, Cristina García Baeza, Fabrizio Ballabio, Fritz Barell, Maria Barreiros, Laura Bonell, Pedro Bragança, S.A. Bramble, Mathieu Bujnowskyj, Daniel Lopez-Dòriga, Bernardo Falcão, Max Frischknecht, George Kafka, Rubén Valdez Ganko, Benjamin Krüger, Andrew Mackintosh, Tiffany Melançon, Mark Minkjan, Migrant Garden, Vicente Nequinha, Francisco Nogueira, Victoria Collar Ocampo, Albert Palazón, Juan Palencia, Enrique Peleaz, Luis Pedro Pinto, Tanguy Auffret-Postel, Joanne Pouzenc, Antoine Prokos, Roland Remaa, Vera Sacchetti, Rabih Shibli, Samuele Squassabia, Mio Tsuneyama, Alan-Miguel Valdez, and Whoodstudio.